This moisturiser is most importantly free from all the nasties that so many of us try to avoid, such as parabens, mineral oils, sodium laureth sulphate and is instead packed with natural ingredients. It contains manuka honey, which is famous for it healing and antibacterial ingredients, making it a great treatment for all types of skin problems. Royal jelly, which is a great ingredient for the prevention of ageing all whilst improving the health and strength of the skin and lastly Bee venom, which is not only a great anti-inflammatory, but also acts as a natural botox. 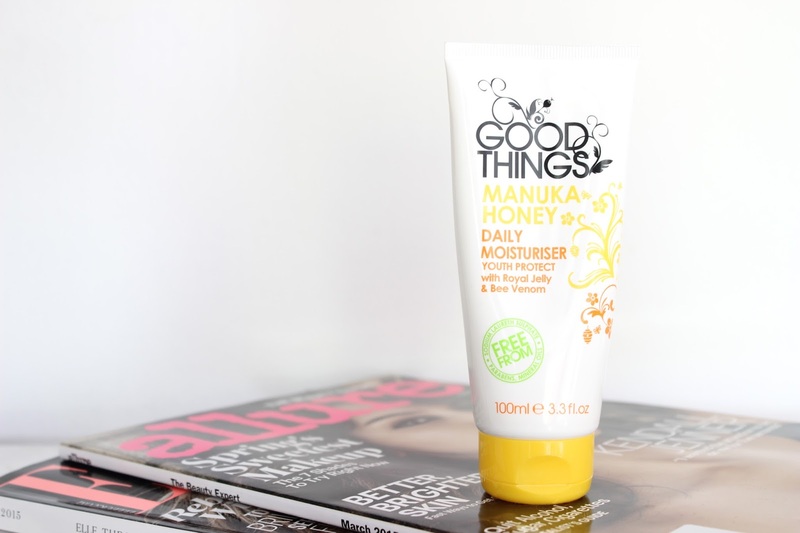 The Good Things Manuka Honey Daily Moisturiser has a rich creamy formula, which initially I thought would break me out (I was wrong) and smells like honey - yummy. A small amount goes a very, very long way. If you apply too much, it can cause makeup to break down after a few hours and can leave you looking a little greasy. So I like to take a very small amount and smooth it all over my face (avoiding my eye area) and neck until it is completely absorbed. After application, my skin feels nourished and soft to touch. After continued use, my skin has appeared far healthier and clearer, not to mention any scaring from previous blemishes are healing nicely. It hasn’t broken me out and is surprisingly great at combating combination skin. This moisturiser comes close to my becoming a new addition to my holy grail line up and is priced at £7.99!